Lower wood farm nevers disappoints. This was my second time staying here. It is a fantastic place for families, as the facilities are second to none. My daughters loved playing in the play barn, on the bikes and scooters and climbing frames. Everywhere is immaculate, inside and out. The swimming pool is a great size and spotless too! We had mixed weather, but that is the great thing about staying there. There is plenty to do inside if it rains. Can’t recommend enough. We absolutely loved this place! Especially on a rainy day, Plenty of things to keep my 3 years old entertained, we could swim in the heated pool and play in the play barn. Lots of things to do for Adults. Very close to the beach. Lovely place to relax! Our cottage was one of the best that we have stayed, the finishing touches have been well thought out would highly recommend a holiday here. Lovely stay, as always, at Pipkin Cottage. Great to be able to meet up with friends in another cottage. Kids loved the swimming pool! We all had a lovely time at Lower Wood Farm and we will certainly be back. We couldn't have booked a better place for my family retirement celebrations. Both cottages were very clean & spotless. Grandchildren loved the pool & play barn + outside play area. Thank you to Jill & Family for making our stay most enjoyable. We very much enjoyed spending a week on the farm. Excellent facilities for children. Cosy and comfortable cottages. We enjoyed a very relaxing week appreciating the excellent indoor pool, the well looked after grounds and the quality of design of the whole site. Our week was particularly quiet because of the time of year but we could see what a great site this is for people with young children. Pipkin was very comfortable and well equipped. Jill was very helpful, informative and welcoming. The location of the site gives the benefits of quiet countryside with access to many good beaches within a short car journey. Looking at Lower Wood Farm on the internet I had high hopes for the accommodation and facilities. Upon arrival it exceeded all my expectations!! We booked last minute but service was great and very accommodating. The cottage was set up for us with an 8 month old in tow, with Cot and high chair already in place and upon investigating the play barn there were toys and books for children of all ages (and adults). The pool was clean and warm which was fantastic for the young one. I cannot recommend this place highly enough and will definitely be staying again. Everything was perfect, the children loved the play areas, play barn and all the ride ons. And the swimming pool, so lovely and warm! We were very comfortable during our stay. You can see that the accommodations and grounds are very well looked after and all the information provided in the folder is very useful. Thank you! Lovely setting. All facilities and features helped make a perfect holiday. Will be coming back again next year !!! A great place to stay! Lower Wood Farm Cottages was a pleasure to stay at. The entire property is immaculate and very contemporary. There wasn't anything lacking there. This is a quiet place with loads of space to spread out in comfort and the staff was friendly. We traveled with a 21 month old and they have a play barn with tons of toys for toddlers! There is a fantastic open grassy area with room for kids to run until they exhaust themselves. There are adult bikes available for use and some tiny bikes as well. The horses at the fence were friendly but watch your kids fingers as they think everything is a carrot. We thoroughly enjoyed ourselves staying here. We initially though it was a bit expensive but in the end we felt it was definitely worth it. No regrets at all! We actually stayed in Russet as we were kindly upgraded for extra space. Clean, comfortable, lovely beds and well equipped kitchen. The play barn and pool were amazing - only 1 other cottage occupied so felt like we had the place to ourselves. Having indoor space for the children to run around and play was great in a chilly November afternoon. Pool warm and lovely atmosphere when it was getting dark outside. Lower Wood farm's facilities were immaculate and maintained to a very high standard, especially the garden, pool and play barn which also doubled as a local information centre and contained an exhaustive supply of activities and places to visit, all neatly arranged. The cottages were nearly all occupied during our stay but the complex had obviously been laid out to preserve the individual privacy of each rental at all times. Pipkin cottage was spacious and well designed with views across open fields from both bedrooms. It all made for a very relaxing and enjoyable week especially as we were able to make full use of the pool and games room each evening after returning from a day's walking or cruising the broads. We had a lovely stay at Pipkin - 5* accommodation and a tranquil peaceful location. Pool amazing too as well as play barn. Very comfy beds!! This was our 4th visit to Lower Wood Farm and definitely will not be our last. Perfect accommodation and location for our UK summer holiday. Lovely cottage, clean, spacious and well maintained to a high standard. Children are exceptional well catered for, not only with the play barn, outside space and play equipment but also the provisions in the cottage e.g. Change mat, sink step & booster seat. We have never stayed anywhere that caters so well for families. Thank you. This was our first family holiday in Norfolk. There were 5 adults and 2 children and we had two cottages between us, Pipkin and The Cottage. Jill was an exceptional host and reassured us if there was anything we needed to just ask. We did not need to do this as Lower Wood Farm Cottages has everything to suit the needs of young children to grandparents. 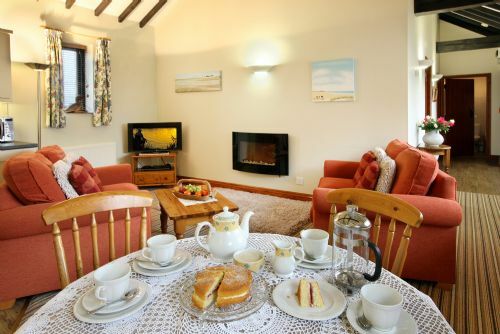 The cottages were fully equipped and the furnishings excellent. The swimming pool and play barn were used daily often before we went out and always on our return. First class accommodation all round. We will return! perfectly situated not far any of the main attractions ,gt yarmouth,the broads,a wild life park,the site is amazing every thing you need play area for the kids to swimming pool,lovely walks, plenty of wildlife,very well kept hosts are superb,can not fault the place,will be going back again. We had a lovely time at Lower wood farm. The children orientated aspect to design of the complex is fantastic and enabled us to have a much easier and more relaxed holiday. The grounds are impeccably maintained and use of the games room, swimming pool, play areas and bikes was wonderful, enabling us to relax on site for a couple of days. Great cottage for the family! My family and I recently stayed at Pipkin cottage on Lower Wood Farm. The cottages are of high quality and clean. The facilities on the farm are great and we all really appreciated the swimming pool (good size with great changing area and shower) and the play barn! We would highly recommend this place and will be booking here again for our next trip to Norfolk. Couldn't have asked for a better stay. We travelled with our 2 year old who absolutely loved the play barn and swimming pool. The cottage was in excellent condition and very spacious. You could easily have a family of four in Pipkin Cottage. Couldn't recommend Lower Wood Farm highly enough. This is our second stay at lower wood farm. We had another great trip and will be returning again in the future. Third time that we have used Lowerwood and it gets better each time. In our case this is because our kids are at the age now where they can start to appreciate the excellent pool and games room. The cottages are really nicely furnished and decorated ...classy countrylife..styley. Appliances , fittings all excellent. Location is brilliant to explore the North Norfolk Coast / Broads area...and actually if you are into walking , wildlife etc there is no real need to get in the car some really good footpaths straight from the farm. Observed and photographed Marsh Harriers @ 300 yards from the Farm. Finally the staff are fantastic ,we had a couple of minor issues (not anyones fault) and the staff dealt with them fantastically. PS. cakes waiting on arrival.....lovely touch. We had a wonderful weekend away at Lower Wood Farms, in the lovely Pipkin Cottage. It's a great setting, with some amazing touches. I would recommend this place for anyone, esp those with young families! The pool is wonderful, kept warm all year round (we were there in November, and it was very cold outside!!) and child friendly, including provision of arm bands, floats and some toys. The play barn is huge, and combined with the outdoor play area has enough toys, climbing frames and activities to keep children occupied for hours and hours on end! A parents dream - enough here to keep young children occupied and plenty for parents to enjoy as well! Stayed for 1 week with 2y/o and 7 month old. Clean, well maintained, lots of facilities and play barn for kids. Downside for us is they are shared with adjacent caravan site (which also allows dogs, whereas cottages don't) which wasn't made clear before we booked and which really should have been. At Lower Wood Farm we are very lucky to have a select Caravan Club CL which takes just five caravans. This is an adult only site (maximum 10 persons). As we do not take dogs in the cottages this facility blends with guests that need to bring their pet if Grandparents are members of the Caravan Club. Dogs are not permitted within the cottage complex or facilities. We are also very lucky to have several footpaths leading from the farm which again makes dog walking a pleasure. These busy footpaths are used by other dog walkers, ramblers and cyclists. We do not consider this being a disadvantage to our cottage guests as the average age of the Caravan Club members is over 40 years old with very well behaved pets, their use of facilities is not an issue with our cottage guests, with most caravan guests staying on the CL preferring to only use the pool when families have gone out for the day. The CL is self contained with their own toilet and shower facility. Perfect for toddler and baby, made holiday easy and fun. Really good location for days out. Loved the welcome tea! Best facilities we have found with young children. Definitely going back! Pipkin Cottage had everything we needed from a holiday cottage. The farm is close to lots of beaches and attractions, and we loved having the option of the indoor swimming pool on site for a spare half hour! The owners had thought of everything to make our stay enjoyable and were very helpful and friendly. Very clean. Fantastic facilities both in cottage and on site. Very clean, comfortable in cottage. Beds are very good. Perfect for small children. Fantastic facilities both in cottage and on site. Wonderful holiday. Would recommend. The is the 3rd time we have stayed at Lower Wood Farm and each time in a different cottage. Whilst Pipkin is the smallest of the cottages we have stayed in it was to the same high standard of the other cottages and was exactly what we needed as a family of 4. We have already booked to return next year. We had a wonderful week at lower wood farm. Excellent amenities and a lovely cottage. The play barn is fantastic as is the swimming pool. Everything very clean and tidy. Very good facilities and the playbarn was very well equipped for both children and adults. It was a well equipped cottage, particularly in the kitchen. Plenty of towels and comfortable beds. The playbarn was excellent and the pool was lovely too. It was great to have some pool equipment to use there (floats, noodles etc). The only minor addition which could have improved it would have been more towel rails in the bedrooms/bathroom. Lovely comfy cottage with great facilities for families. Really well equipped play barn, outside toys and great indoor swimming pool. Upon arrival were greeted by a lovely afternoon tea, nice touch. Location is brill, lots of thing's to do near by. Only downside is countryside setting not good if you need WiFi but this is being upgraded ATM. A superb place for a family with children ages 2, 7 & 9. Pool was lovely, play barn and children's play area were the perfect entertainment on rainy days or after a day out. The owner had thought of everything and was very helpful. Thank you Lowerwood Farm!! There is lots to do in the local area too ..highlights for us were hiring a boat on the broads , dinosaur land (about 1 hr away ) and Horsey beach where we saw the seals . A perfect place to relax with everything you could need. Everything so clean, spacious and plenty of sports and games to enjoy. Ideal for anyone who likes the Countryside but only a few miles from Great Yarmouth. A wonderful short stay with the family. The accommodation was superb very homely, the facilities excellent and we will be returning later in the year. A great stay; thank you! We'd love to come back soon. Bonus extras included Ronnie and Woody, while local highlights included Winterton, its cafe and Thrigby Hall. Some previous guests had clearly thought Thrigby to be a bit 'tired' - but we couldn't have enjoyed it more! An idealistic cottage set in lovely countryside perfect for a mid week break. The accomodation was clean, comfortable and cosy. A home away from home. As grandparents, this made an excellent place to gather all the extended family together. We rented Pipkin, Russet and Bramley and they were all excellent. The Games Barn and Swimming Pool were both clean, warm and well equipped. It was a bonus to find bikes there but some of them could have done with some attention. We had a great week in Pipkin Cottage with our 3 year old. The cottage was very comfortable with everything provided and the facilities of the complex are excellent. We used the pool, play barn and slide/swings every day. Jill was very helpful and runs a tight ship so you always feel assured help is at hand if required. The location is wonderful with easy access to beaches and days out to amuse a toddler (such as the superb Bewilderwood). We would not hesitate to return. Fabulous stay, lovely setting and great facilities. Some nice touches, especially cake on arrival! Would definitely recommend, and hopefully return, perhaps as part of a larger party. Brilliant place to stay. In the middle of the countryside but just a short drive to the beach and shops. Ideal for families with plenty to entertain the children. Good value for money. Great swimming pool. Will certainly return. didn't actually stay at Pipkin but upgraded to Bramley, due to a damaged bath panel? how many places would have bothered over that, which sums up the whole thing at Lower wood, attention to even the smallest detail, Bramely was lovely, games room a pleasure and the pool an absolute joy. What a fabulous family break. The cottage was extremely well presented and the Tea and cakes were very welcome after a lpng drive. It is obvious that the owners are passionate about delivering fantastic accomodation with a warm welcome. The indoor pool, play barn (filled with various toys) and outdoor play equipment were enjoyed by the kids. Location was also excellent with easy reach of the Broads and Gt Yarmouth. We will certainly be visiting again! Really lovely. So well managed and any issues were dealt with swiftly and well. Only small problem is that many of the battery operated toys were not working, which can be very disappointing for children. Also the toys could do with more regular cleaning. Wood Farm. The grandchildren and all the family loved the pool and the play barn. We had a lunch party with more family coming for the day and the room provided was perfect as was the food provided by the recommended caterer. The three cottages we had were first class with every possible need catered for. The attention we had from Jill was excellent as was the welcome tea tray on our arrival! We hope we can come back again for another family get together in the future. As Grandparents, we booked on the recommendation of our daughter and her husband who had stayed earlier in the year with their two children (2 and 4 Years). On our arrival without any children, we were initially a little bit apprehensive, but this was soon dissipated. The location was really very good (down a longish approach country lane through open fields). We were met and shown our particular cottage, where we unpacked. Looking around, we could see that it had practically everything anyone on holiday could possibly need, all in very good condition - nothing was older than a few months, it appeared. My wife is very keen on swimming, so we inspected the Pool which was better than a lot of the fiurst class hotels that we have stayed at. Summing it up, the facilities were extremely impressive. The location was close to Caistor and Great Yarmouth, and more importantly, The Broads, where we spent a lovely afternoon being shown around by a very knowledgeable guide, both on land and on water. Around the whole area were various p[laces where you could get a very decent meal quite inexpensively. We can find nothing in our holiday that would lead to a criticism - a wonderful short break, Both of us were very sorry to be leaving after such a short break, and yes, we would go there again. We found the cottage very welcoming,comfortable and very clean. The swimming pool was excellent. All the grounds were beautifully kept and the games room well appointed.We enjoyed sitting outside in the courtyard but unfortunately did not have an opportunity to use the barbeque. Pleased you enjoyed your stay. Family fun, relaxation and home from home comforts! We had a wonderful stay at Lower Wood Farm and wish we could have stayed longer in order to enjoy all the facilities. It is a beautiful setting and ideal for young families. We made plenty of use of the swimming pool which was always clean and pleasantly warm. The cottage was cosy, well laid out and very well equipped. We were close to the beautiful sandy beaches and the Norfolk Broads so this was a perfect location for us.